I recently had the opportunity to test out some hair products from MopTop. If you don't know I'm natural. So I have been testing out many different products to see what works best with my hair or what doesn't. So I tried their Travel Kit which consists of their Gentle Shampoo, Daily Conditioner, Detangler & Refresher Spray, and their Light Hold Anti-Frizz Gel. This kit retails for $23, a little pricey for about 2 fl.oz. bottles. You don't need a lot of product for this kit to do it's job, so if you were to invest in the bigger bottles you would have these hair products for quite a long time. When I first received my package it came nicely packed into a clear case, which I saved for traveling purposes. If you know about how the whole airport-plane-traveling thing goes, you should know how the packaging makes your life easier. I was happy that this shampoo doesn't have any sulfates nor silicones in the ingredients. After using this shampoo my hair felt dry yet clean. Which is a good/bad thing for me because I have extremely dry hair so it would take a good "pre-poo" to give me moisture after a shampoo session. So I don't blame the shampoo, I'm going to try using it again but with a pre-poo before hand. Loved that it doesn't contain any sulfates nor wax. Also because their products are all made for dry and frizzy hair, this conditioner really did the job for me. It left my curls feeling soft and light. My hair felt more moisturized oppose to it's natural dryness. I barely used this product but I tested it out on my sister when she was getting her hair curled the other day. This product has no parabens nor silicones. When ever my sister washes her hair it usually tangles a lot because she has about waist-lower back length hair. When she used this detangler, just a few spritz, she said "wow there is no knots". This gel is like no joke. First it really has a light hold, but it locks in your curls. I seriously had perfect curls all day. Only thing I disliked was that it started to create the white flakes all over your hair at the end of the day. Other than that I was very pleased. 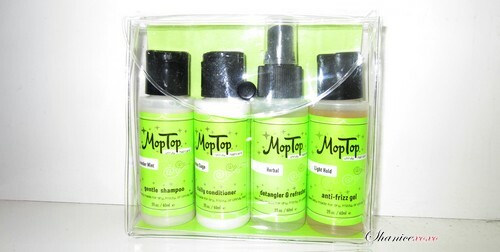 I was quite pleased with the Travel Kit from MopTop. I recommend their products to anyone with dry curly hair. disclaimer- moptop sponsored this review. i was given the products mentioned above for free for a honest review. my opinion was not influenced by any means. Never heard of this product before but definitely checking it out now.